I had another deadout last week--- unfortunately one of my best honey producers, too--- and if was kind of a mysterious one. 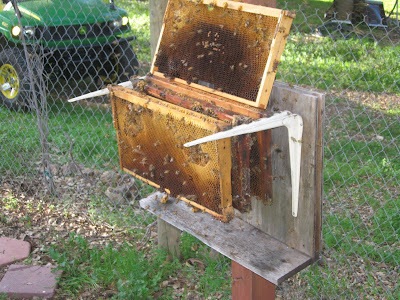 The queen was on the comb, barely alive, as were a handful of bees on a couple frames. But there were no OLD bees; just young ones. Very typical of CCD; Colony Collapse Disorder, the unexplained malady that has caused such a high rate of hive loss over the past few years in the beekeeping industry. Also typical of CCD--- there was still capped honey in the hive. So, I thought I'd give my surviving hives a treat, and hung them on this frame hanger I've got in one of the beeyards. It didn't take long for the gals to find this, and within 30 minutes after I took this picture these frames were absolutely covered. I also put a couple of other capped frames into one of my weaker hives, to hopefully give them a boost. It's been a little disheartening this winter--- I've lost quite a few hives in the unusually wet and cold winter--- but I think we're turning a corner. This past week the weather heated up and the white ceonothus just exploded into bloom all over the hillsides, and today I watched a number of bees hit their hive entrances heavily laden with yellow pollen. Good sign--- hopefully the brood build-up for spring has begun!